Whether a Parent, Child or Grandparent - we always love to hear about your experience reading Krista- link - a la ! I thought the story was cute and really enjoyed the twist on the classic story Cinderella. I kind of reflected back when I was younger as like Krista-link-a-la I would of used a sneaker also as I was not very girly growing up. A humorous story with great imagination. The story is also a teachable moment in embracing who you are ( in this case born with large feet) - despite the challenges one faces in one's life. anti - bullying lesson, paying back her three brothers with humour. Delightful book. We are invited to join in, along with the imagination of the author. I found during the book's reading, I was anticipating what was going to happen next, only to be taken in another direction ! This book gently reminds us that we can become whatever we want but to do so we often need the love and support of those around us- and it needs to be positive. I loved the way the story drew us in to being a part of the play Kristalinkala wrote. I will recommend the book to friends and family. This is a heart warming story about a spunky girl who explores her imagination on a grey rainy day...I really liked the story and how you got a feel for both the local community, and characters in the story. This is a great book for all ages and is an inspiring story about a little girl who is full of life. it is easily relatable. I have enjoyed sharing this book with the young people in my life. Krista-link-a-la and the Size 13 shoes is a story for all ages. Drawn from the fertile imagination of an 8 yr immigrant girl, her struggle growing up with large feet ( and 3 brothers) catapults her into creating a play for the neighborhood children to star in. She dreams up a charming, heartwarming homage to the classic Cinderella tale, using her creativity to celebrate her big feet by replacing Cinderella's delicate glass slipper with her oldest brothers size 13 red running shoe. A sure to delight story ! This children’s book is the true story about the author and one of her favorite memories when she was a little girl. This enchanting tale is very cute. I found it to be inspirational. It is great to read a story about an adult who started out with a dream when she was little girl. Lucky for her she continues that passion and now has a job she loves. I really enjoy how real pictures and illustrations are combined together. It gives you the overall feeling of the setting. The illustrations are well done and match what I would picture in my head. They made me laugh as they told a story in themselves. This book portrays the true nature of little girls, and what great imaginations we have. My favorite part of the story is when Karlko tries to put a shoe on Krista-Link-a-La. I love trying on my Mother's shoes and walking around the house in them. The giant red tennis shoes are very funny and I wish I had a pair of them. When Krista-Link-a-La makes a stage and costumes out of her Mothers dirty clothes, I found it hilarious. I will have to try this sometime. Although she has a big problem for a child - big feet - she finds a way to find humor in it. The moral of this story is, "If you have a passion, you should follow it and see where it leads you. Be adventurous." Krista-Link-a-La has an idea and comes up with a plan and follows it through. Even as an adult, she still remembers this special time of her childhood. This book is suitable for ages 2 to 9 as it will make them laugh. There are complicated words so I would recommend the self- reader for ages 9 and under. I give Krista-Link-a-La four out of five golden book marks. Remember to keep reading, it always a fun adventure with KIDS FIRST! Tina Petrova's children's book is so great. I'm going to remember this for holiday gifts. It's so playful and sweet. Yet I think it could have an underlying message of always encouraging oneself to explore the many creative ways of seeing one's circumstances. Not only did the little girl figure out how to handle her obstacles, but in the meantime she created pleasure for others. Great message!! This is a heartwarming story which really resonated with me because although it is a children's book I really felt that the message is for everyone. It's about fitting in a as a child and who can't relate to that? It put a smile on my face. Well done. Author/ Mom, Los Angeles CA. ... A charming story, written from a child's perspective for children. It is not only about a child but large feet- but the beginning of a promising career of the book's author. Well written and fun ! 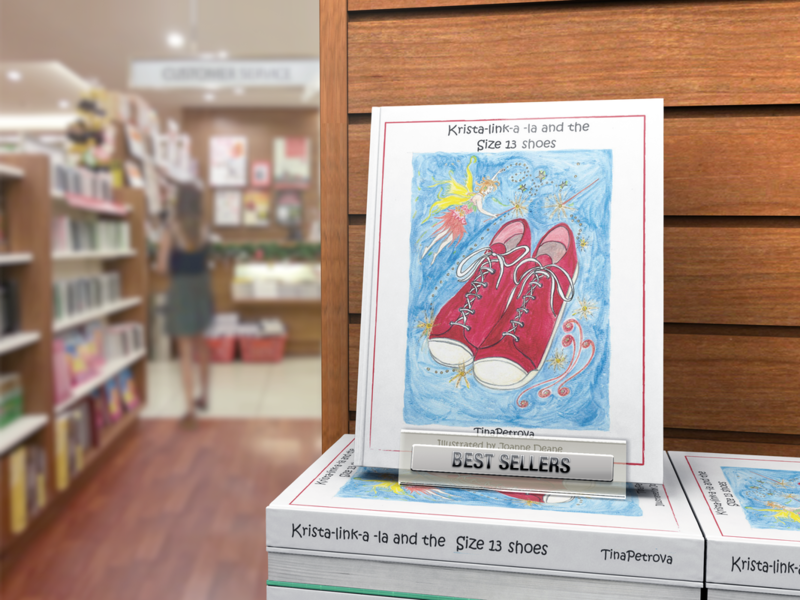 Canadian director, producer and author Tina Petrova recently released her first children’s book, Krista-Link-a-La and the Size 13 Shoes. Currently residing in Toronto, Petrova kicked off her book tour last Spring at the RedFish BlueFish Creative Café where she shared her latest writing project. Born in Sault Ste Marie, Petrova is the daughter of an immigrant family from Slovakia. Her story pays homage to her strong family heritage all the while calling upon her childhood experiences writing and directing plays for her neighbourhood friends.